Leeks and potatoes are a classic combination, and I’ve been really craving those flavours over the last few days. They do of course make a wonderful soup, but I needed something to take to work for lunch and soup isn’t always so practical in the office. So I thought why not try translating the flavours into a salad! The slightly tangy, herby dressing works very well with the vegetables, and with the addition of mustard makes a great marinade for the tofu. The mustard tofu croutons add protein to the salad as well as being delicious, so it’s filling and sustaining for the whole afternoon. First drain the tofu, and then press it for 15 minutes to extract some of the liquid. I buy the sort that comes in a plastic tray, so I tip the tofu into a shallow dish, and then sit the empty tray on top with something heavy in it. Today I used a bottle of fabric conditioner! While the tofu is pressing, get the vegetables and herbs washed and chopped. Next make the dressing, mix the parsley and thyme into the soy yoghurt and season with salt and pepper. Spoon half of the dressing onto a baking tray and mix the mustard in. Reserve the other half. 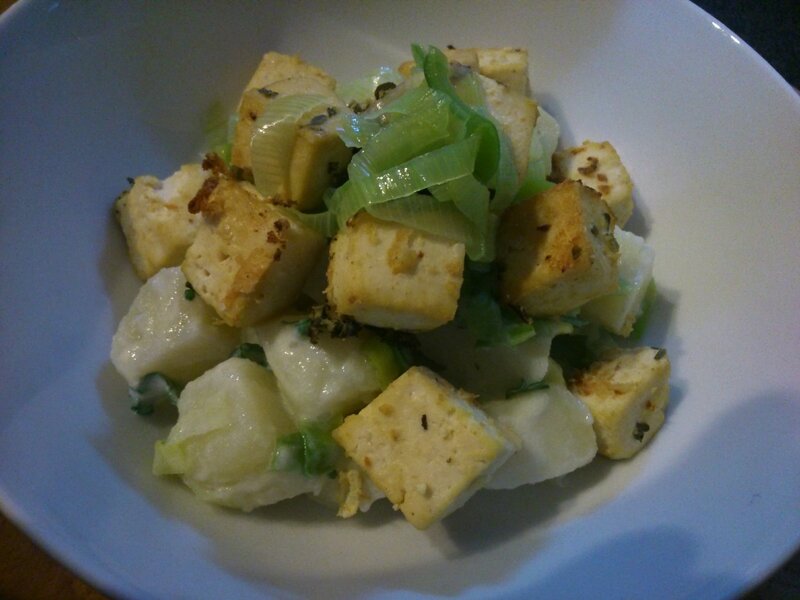 Cut the tofu into cubes and toss it in the mustard dressing. Bake for 30 minutes, turning after about 20. The tofu will stick a bit to the tray, if it won’t shift at all give it another couple of minutes and try again. While the tofu is baking, cook the vegetables. Simmer the potato cubes until just soft, about 8 minutes. Steam the leeks for 6 minutes until silky soft, I do mine in the microwave. If there are a couple of spoonfuls of steaming liquid left then add them into the dressing for extra flavour. Cool the vegetables a little and then mix with the reserved herb yoghurt dressing. Top with the mustard tofu croutons, and serve.